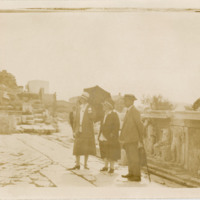 Photo of M. Carey Thomas, Edith Lowber and an unidentified guide during her trip to Egypt in 1929. 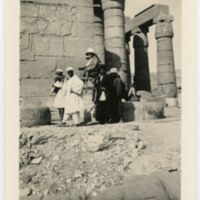 Photo of M. Carey Thomas with Edith Lowber and an unidentified guide during her trip to Egypt in 1929. 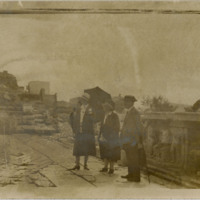 Photo of M. Carey Thomas, from a distance, standing next to the ruins of an unidentified building during her trip to Egypt in 1929. 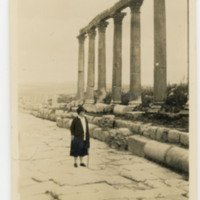 Photo of M. Carey Thomas, from a distance, standing next to an unidentified ancient temple or building of some sort. 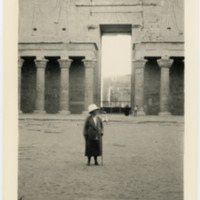 This is from her trip to Egypt in 1929. 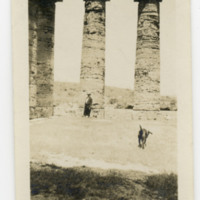 Photo of M. Carey Thomas from a distance standing next to ancient ruins with what looks like a dog running (closer to the photographer) in the background. Photo of M. Carey Thomas being carried on a chair by four unidentified men during her trip to Egypt in 1929. 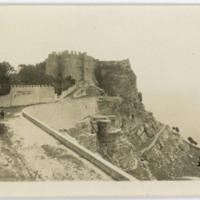 Photo of an unidentified site taken during M. Carey Thomas' trip to Egypt in 1929. There is a structure pictured at the end of a hilly, winding path and it overlooks a vista.